Before adopting the Fair Defense Act in 2001, Texas was considered abysmal in legal circles when it came to providing representation for the poor. Proponents and critics of the current system agree the situation has improved since lawmakers started requiring counties to implement minimum representation standards. But has it improved enough? Texas is reaching a crisis point, putting itself at risk of a civil rights lawsuit — or worse, a total meltdown of the criminal justice system — because it so severely shortchanges the system designed to ensure impoverished accused criminals get adequate legal representation, advocates told a Senate committee last week. Nine years ago, before Texas adopted the Fair Defense Act, the state was considered abysmal in legal circles when it came to providing representation for the poor. Texas had more people in jail, more people on death row and executed more people than nearly any other state, but there was no mechanism to provide decent legal defense for the poor. Proponents and critics of the current system agree that the situation has improved since 2001, when lawmakers started requiring counties to implement minimum representation standards. Thousands more poor defendants are getting attorneys now, and 91 counties are served in some capacity by a public defender system. “We have made such huge progress in that area that we’re no longer the laughingstock of the nation,” Tony Fabelo, director of research at the Council of State Governments Justice Center, told lawmakers. It’s better, but it’s not good enough, advocates say. “It’s just not as bad,” Blackburn says. 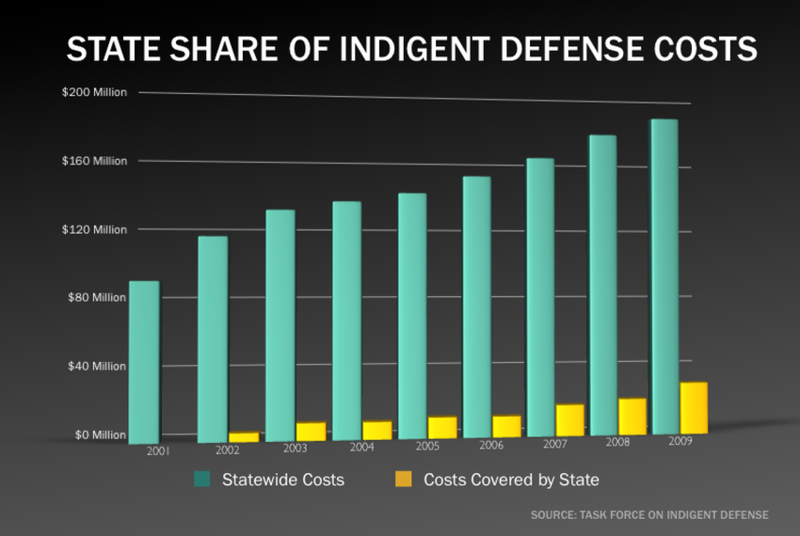 While courts spent more than $186 million on indigent defense in 2009, according to the Task Force on Indigent Defense, the state chipped in only $28 million — barely enough to meet the constitutional requirement to provide adequate legal representation, advocates say. With state lawmakers looking at the possibility of an $18 billion budget hole next biennium, it's highly unlikely that the Legislature will put any more money into indigent defense. Advocates are clinging to the little money they already get, asking that leaders ensure the dollars are spent effectively. And they’re worried that as the economic troubles trickle down to local governments, some of the indigent programs could disappear altogether. Before 2001, there were a scant few public defender offices in Texas, and the ones that existed had no well-defined minimum operating standards and no state funding, Fabelo told the committee. The Fair Defense Act required counties to create systems to provide representation for the poor. Counties can have judges assign attorneys from a list of lawyers, they can create public defender offices that employ attorneys to represent the poor, or they can create a system in which private attorneys contract with local courts to provide services. Statewide, there are now 16 public defender offices that serve 91 counties. Most counties, about 71 percent, allow judges to assign lawyers to indigent accused criminals, according to the Texas Fair Defense Project. The Task Force on Indigent Defense gives counties money to help defray the increased cost of representing the poor. Money for the program comes from a variety of court fees, which in 2009 generated about $31 million, according to the task force. Most of the money is distributed based on population and on the amount of indigent representation the counties provide. A smaller portion is meted out in grants for counties to start public defender programs. Statewide, costs for representing the poor have nearly doubled since 2001, when courts spent about $94.7 million. By 2009, the cost skyrocketed to $186.3 million, according to the task force. Counties absorbed the biggest chunk of that cost. The state paid just 15 percent of the total indigent representation costs last year. That’s a great improvement over the zero dollars Texas was putting in before, said Sharon Keller, chairwoman of the task force and presiding judge of the Texas Court of Criminal Appeals, in testimony before the Senate committee. Plus, she said, a structure that requires adequate representation for the poor now exists where none did previously. “We have raised the bar,” she said. But Keller and others at the task force agree the state’s not doing enough. “What we’re trying do is figure out how the state can share more of these responsibilities with local governments,” Jim Bethke, executive director of the task force, told the committee. What compounds the problem is that the state isn’t the only entity working on a shoestring budget. County governments are feeling the pain of falling housing sales and property tax collections too. David Slayton, director of court administration in Lubbock County, says costs for providing indigent representation there have doubled since 2001, from $1.5 million to about $3 million. The state picks up less than 5 percent of that cost. But grant money from the task force is paying start-up costs for the county to develop a new regional public defender office to represent indigent defendants in capital cases in 70 West Texas counties. Grant dollars are also helping the county launch a defender office for those with mental health problems. “One of the things that concerns me is just the true sustainability of these programs … from a funding perspective,” Slayton says. If the state funds give out, he says, the counties won’t be able to step in to keep the new courts on track. “It would jeopardize the ability of those programs to continue,” Slayton says. The question for the state and for criminal justice advocates, says Andrea Marsh, executive director of the Texas Fair Defense Project, is at what point the funding becomes so minimal that it is impossible to meet the constitutional obligation to provide adequate defense. “The counties are footing most of the bill, but … there are very real limitations to their ability to raise additional dollars,” Marsh says. The more the funding dwindles, the more the state is at risk of a lawsuit. “The situation in Texas is not that different from the situation in states that have seen litigation,” she says. In addition to funding questions, Marsh says, there are concerns about the fairness of the system. The American Bar Association, in its best practices for public defense, recommends that lawyers for indigent defendants be chosen independently — not by the judge, as is the case in most Texas counties. The association also calls for independent oversight of indigent defense lawyers and monitoring of their caseloads, neither of which regularly happen in Texas, Marsh says. Another problem, she says, is that county courts appointed lawyers for defendants, on average, in just 13 percent to 22 percent of misdemeanor cases. Montana was forced to overhaul its criminal defense system in 2005 after the American Civil Liberties Unions sued the state over a slew of representation shortcomings similar to the ones advocates identify in Texas. Montana allowed poor defendants to spend months in jail before trial, according to the Chicago Tribune, and none of the accused in misdemeanor cases were appointed attorneys. Lawyers for the indigent were unable to fully investigate cases because they didn’t have the funds. Michigan is now in the middle of litigation over its criminal defender system, which the ACLU alleges is unconstitutional because it lacks state funding and oversight. Texas lawmakers may not have the wherewithal this year to put any more funds into indigent defense, but Marsh says legislators might help ward off litigation by making changes to the program. They should ensure the current funds are used effectively by requiring more oversight of the program, requiring independent selection of attorneys for the poor and giving counties incentives to implement public defender programs, she says. Blackburn is less optimistic. “They’re all trying to tinker with a system that is so fundamentally broken that no amount of tinkering is ever going to fix it,” he says. While he believes a complete overhaul of the indigent defense system is necessary, he says he’s not hopeful litigation will prompt change in Texas. What’s needed, Blackburn says, is for lawmakers to take initiative to develop a new law that requires public defenders statewide have appropriate oversight, independence and funding. In the current system, he says, counties have little incentive to ensure poor defendants get adequate legal representation. If defendants in felony cases don’t get good legal advice, they usually go to prison, where the state foots the bill. If defendants in misdemeanor cases don’t get lawyers, they usually plead guilty to charges that result in fines and fees that boost the county’s bottom line. As counties face more and more financial trouble, he worries local officials will begin relying on those fines and fees to generate revenue. Without true reform, he says, the system is likely to eventually cause so much public backlash that lawmakers will either make changes or risk losing their jobs. “I don’t see any real prospect for big reform until the true meaning of the current broken system seeps into the average person’s consciousness,” he says.